People who earn good money creating and selling items on the Steam Workshop are now able to share their gains with those who've aided their efforts. Valve Software's Steam Workshop service is brilliant. Not only does it offer players a single, easy to use resource for the modifications that make gaming on a computer so appealing, but it also allows players to create and profit from their creations. Now those players can share the spoils of their work with others. As Valve states, "creating high quality content for games is rarely a solo endeavor." 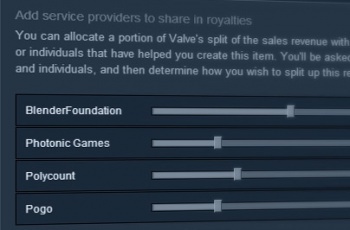 Now if you pull in a significant amount of cash by selling a hand-crafted hat for Team Fortress 2 you're able to split your earnings with the people who made the tools you used and anyone who assisted in your work. Best of all, this allotment is not pulled from a player's own royalties, but is instead lifted from Valve's cut of the cash. Earmark a 20-percent wage for that guy who built the skin for your hypothetical, virtual hat and you'll still see the same amount of cash while said designer will also earn a bit of money and (importantly) official recognition of his contribution to the project. The biggest caveat of this scheme is that the list of groups/individuals you can share your money with are currently pre-determined by Valve. The firm claims to have assembled a list of the most common, prolific tool makers and community members who would be likely to receive official propers and some money, which is helpful, but certainly more restrictive than an open system that allows players to transfer royalties to anyone with a pulse. This new scheme is currently active in Team Fortress 2 and DOTA 2, though we'd expect that with success Valve will roll the program out to other Steam titles.